Retail is here to stay; but in what form? MBA graduates up to tackling the growing challenge of E-commerce should consider entering the retail industry. An analysis of our 250,000+ data points revealed insights that will prove useful for any MBA considering a job in the large retail industry. Overall retail sales in the U.S. are expected to hit $5 trillion in 2016. However there’s no hiding the fact that E-commerce is eating up traditional retail market share, so established companies need to be strategic moving forward. Amazon alone captured 51 cents of every dollar spent online by Americans in 2015, so how should other companies compete? The average salary of MBA graduates entering the retail industry is $108,603 (43rd percentile). This base salary is typically supplemented with an average bonus of $13,316 (34th percentile) and more generous stock compensation of $15,579 (91st percentile). All in all, an MBA graduate seeking a job in retail can expect a total starting compensation of $176,428 (66th percentile). This package is about $28,000 below that of MBA graduates working in eCommerce. Additionally, MBA grads in eCommerce reported an average stock compensation bonus of $31,000 – more than double what retail employees reported. To see compensation data for this industry and how it stacks up against other top industries, just sign up for free here and explore intuitive dashboards, representing data from almost 4,000 employers. MBA graduates working in retail may earn less than some other industries, but they also spend less time at the office. At just 50 hours per week, the average time spent working is 4 hours below average for all other MBA graduates. Additionally, time spent traveling is half the average at only 13%. While some industries congregate in specific areas, MBA graduate jobs in retail are spread across the country (and world!). If 13% of your time is still too much traveling for your taste, consider Macy’s or Target; they both report travel percentages below 10%. Overall satisfaction scores for MBA graduates working in retail are only slightly below average, and there are still many companies with fulfilled employees. The average happiness rating for an MBA graduate in the field is 6.2/10, while the average for all MBA grads is 6.7/10. Impact of work and culture were also minutely below average at 6.8/10 and 6.6/10, respectively. Despite these lackluster averages, there are still firms that receive high marks. For example, employees at T-Mobile awarded company culture the full 10 points. MBA interns in the traditional retail industry actually reported higher satisfaction scores than full time employees. The average happiness score was 6.6/10, and recommendation rating was nearly 20% higher than full time scores at 6.7 out of 10 possible points. It’s also useful to note that internship offers tend to peak in February. If you are interested in transitioning from an internship role in retail to a full time position, you aren’t alone! Nearly 85% of internships translate to full time gigs. Offers for these full time positions are the most plentiful between August and October. For both full time and intern positions, the most lucrative opportunities and compensation packages were obtained via on-campus resources and interviews. When it comes to demographics, men account for about 60% of internships and fill 70% of full time positions. These sorts of ratios aren’t unique to the retail industry, though. Similar scenarios can be seen in Investment Management, Real Estate, and Software. Don’t be quick to blame the companies though, since the problem traces all the way back to MBA program enrollment. Only 36.4% of MBA degrees conferred in 2013 went to women. The imbalance continues into the C-suites across America, as only 4.6% of top executive positions are held by women in Fortune 500 companies (despite the fact that upwards of 31% of Fortune 500 CEOs are MBAs). Efforts to increase female MBA enrollment are paying off at schools such as Stanford and Berkeley, where females now make up a little over 40% of MBA enrollment. Business school faculty is also predominantly male, with schools such as Columbia having only 17% female faculty. However the number of females enrolling in MBAs is increasing, albeit slowly. Our database of nearly 5,000 employers highlights the fact that female MBAs receive total starting compensations that are about $45,000 less than men, while actually working more hours and traveling a higher percent of the time. Some of the differences might be attributed to different pay rates for varying functions; there are higher concentrations of women in Marketing and men in Corporate Finance. However the shared function of Corporate Strategy still shows higher compensation for men. These numbers don’t tell the whole story, but may highlight some room for improvement. No matter your function of choice, there’s room for your abilities in the traditional retail market. While areas such as corporate finance, operations, and corporate strategy are readily filled with MBAs, there are a variety of skills needed. To learn about all of the MBA functions employers are seeking, simply sign up for free and use our Career Explorer. As a result of the vast activities involved in a retail firm, there are many possible MBA positions to choose from. Options include Merchandising Operations at Wal-Mart, Brand Management at Starbucks, or acting as a Buyer at Target. Some popular employers can be compared below, and you can view a full list of employers and their compensation and satisfaction ratings on the Career Explorer. Mass market retailers are a popular choice for MBA graduate jobs, however there are opportunities available in the high-end and luxury market as well. Schools such as the London Business School and New York University’s Stern School of Business offer luxury retail programs for MBAs that lead to positions with top of the line brands such as Chanel and Coach. These programs are gaining popularity, and LBS’s Luxury Management Program was only able to accept 12 of the 100 applicants hoping to gain a spot in its first year. 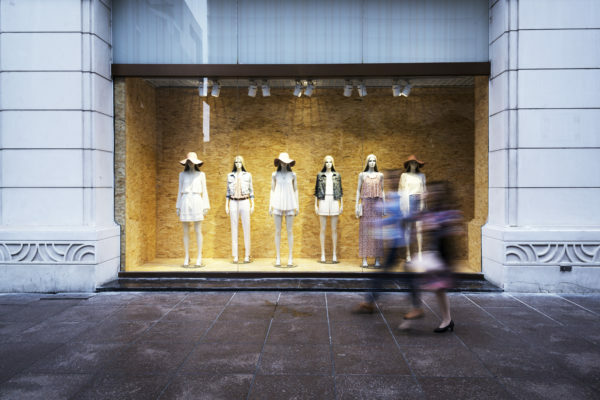 Whether you prefer to work home or abroad, connect with mass market or luxury, or are interested in innovating a threatened industry – retail might be just the place to put your money.